This recipe for creamy Slow Cooker Snowflake White Hot Chocolate requires only four ingredients and is perfect for your holiday parties or a cold winter day! Throw it all in the crock pot and let it warm! I am over here counting down the days until Christmas in typical 5-year-old fashion. It is coming up so quickly…as in NEXT week! I’m here to help you with your holiday parties menus, because it’s what I do. Ready for the best crock pot hot chocolate of your life? Put down those instant hot chocolate packets because all it takes to make this white hot chocolate is throwing four ingredients into your slow cooker and DONE! It will be the best decision you will make all winter. If you haven’t been putting your slow cooker to good use so far this season, you’ve been seriously missing out on the glory of this essentially magical cooking machine. All you have to do is dump the ingredients into it, give it a quick stir, and you’re on your way to white chocolate heaven. This is the creamiest, thickest, richest, richest (I said that word twice for a reason) and most luxurious white hot chocolate out there. I mean, is there anything better than sipping melted chocolate out of a mug or glass? This recipes gives you a good excuse to do just that. I’m that weird person who drinks cold coffee beverages all winter long because I claim to hate drinking hot drinks. Um, not the case here. 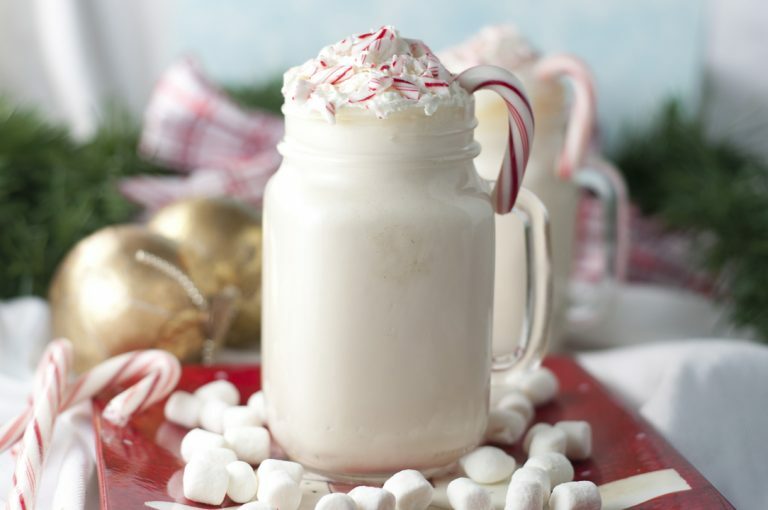 This white hot chocolate that’s loaded with delicious dairy is one hot drink this girl can drink ’til the cows come home (see what I did there?). If you’re not a huge white chocolate fan (White Chocolate Peanut Butter Oreo fudge anyone? ), definitely try my tried and true Creamy Crock Pot Hot Chocolate! 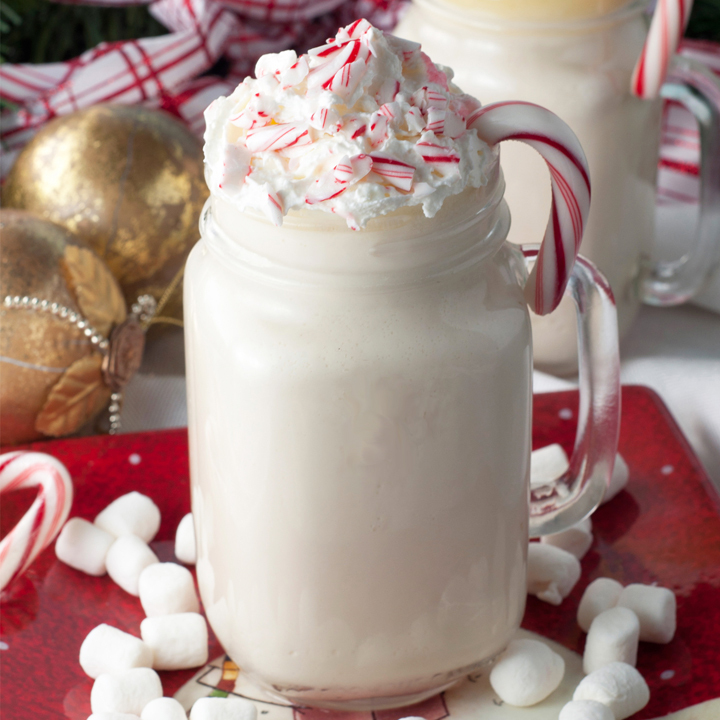 I’m loading you up on dairy and sugar today with this white hot chocolate recipe (’tis the season?) but wanted to take a moment to talk about a great cause that is going on right now called The Great American Milk Drive. Did you all know that milk is the No. 1 nutritious product requested by food bank clients, but it is rarely donated? The Great American Milk Drive is delivering thousands of gallons of milk to families who would otherwise go without. This is a scary thought to me since nutritionists recommend 3 servings of milk a day (a gallon each week) and 46 million Americans served by Feeding America normally get just 1 gallon of milk for the ENTIRE year. This means that a lot families are missing out on so many health benefits and nutrients. I love seeing such a spirit of giving, especially this time of the year. You can join me in helping out those in your communities that need help by going to www.MilkLife.com/give to donate and/or to see how much milk has been donated so far to food banks in your state. Any amount helps, and to put things in perspective, a $5 donation is equal to about one gallon of milk. Now, here is where you can have a little fun with the people in your life and raise money for Feeding America’s The Great American Milk Drive all at the same time. The American Dairy Association and Dairy Council has launched the #GiveAGallon Milk Challenge to raise awareness about hunger and the need for milk for families in need. Each time a photo is posted on Instagram, Twitter or Facebook of a person, group (or even your pet!) sporting a milk mustache with the hashtag #GiveAGallon and texting “MILK” to 80077 now through Jan. 15, 2016, ADADC will donate $1 to Feeding America’s Great American Milk Drive. This goes on until $25,000 is donated. You can go ahead and have fun with this and your kids will love knowing they are helping underprivileged families in the process! These three cute little girls in my life got in on the fun! Has a milk mustache ever looked so darn cute?! These little sweeties want you to participate, as well! I am also excited to invite you to join in on a Twitter party with me Thursday, Dec. 17, from 9-10 p.m. EST. For everyone who attends the party and uses #GiveAGallon, $1 will also be donated to The Great American Milk Drive. How awesome and simple is that?! We’ll be chatting about holiday recipes, cooking tips and ways we give back. See you there! So, add this Snow Flake White Hot Chocolate to your menu for the holidays or make it while the kids are home on winter break. They will love you for it and the calories will be totally worth it. Merry Christmas! This recipe for creamy Slow Cooker Snow Flake White Hot Chocolate requires only four ingredients and is perfect for your holiday parties or a cold winter day! Stir together the whipping cream, milk, vanilla, and white chocolate chips in a 5 quart slow cooker/crock pot (a little smaller or a little larger could also work). Cover and cook on low for 2 to 2½ hours, stirring occasionally, until mixture is hot and chocolate chips are completely melted. Stir again before serving. Keep on warm setting if you're serving at a party and want to keep it warm. Stir occasionally so white chocolate doesn't start to solidify on the top. Be careful stirring as air bubbles can sometimes happen at the bottom of the slow cooker when white chocolate gets very hot. 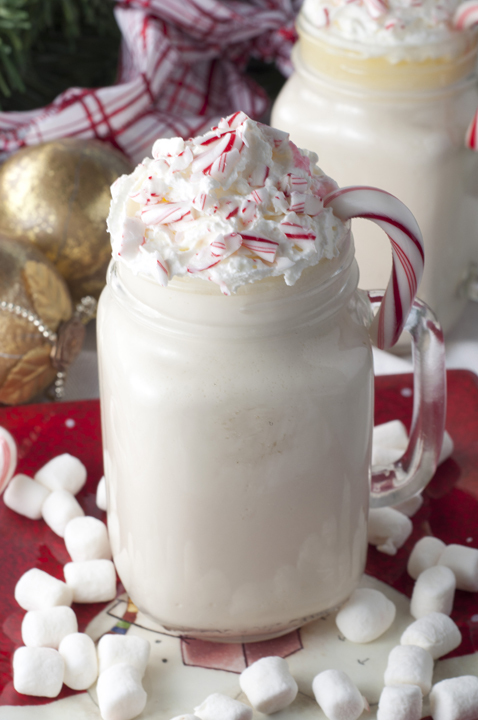 Garnish with whipped cream and crushed candy canes, as desired. 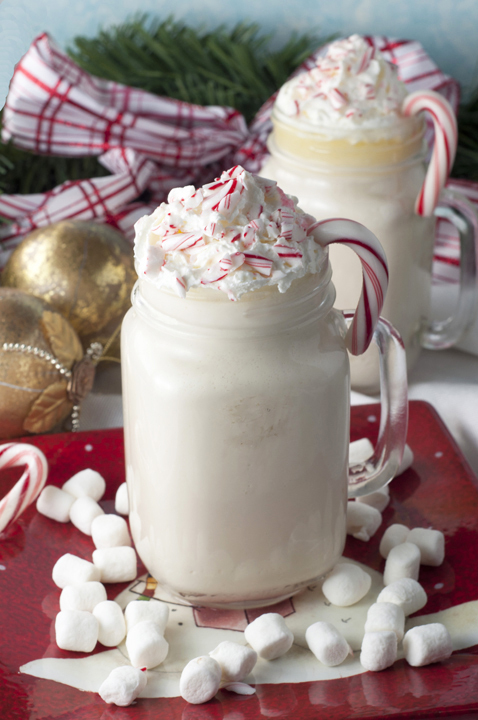 Serve with a whole candy cane in the cups which will give the white hot chocolate a slight peppermint flavor as the candy cane melts. Enjoy! 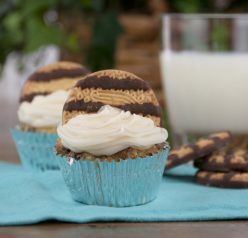 Be sure the check out the other wonderful recipes being shared as part of the #GiveAGallon campaign with American Dairy Association and Dairy Council! Disclaimer: This post has been sponsored by ADADC. All opinions remain 100% my own, as always. I need to try out your recipe the next time I host a party in the winter! Sounds awesome, and I love the photos with the milk mustaches! Oh my gosh – I love those cute frosty mustaches! 🙂 This hot chocolate sounds incredible and I love the convenience of making it in the slow cooker! I absolutely LOVE this hot chocolate! I never thought to make white hot chocolate before and yours is gorgeous! I love white hot chocolate! I can’t believe it’s almost Christmas either. Where has this year gone???? 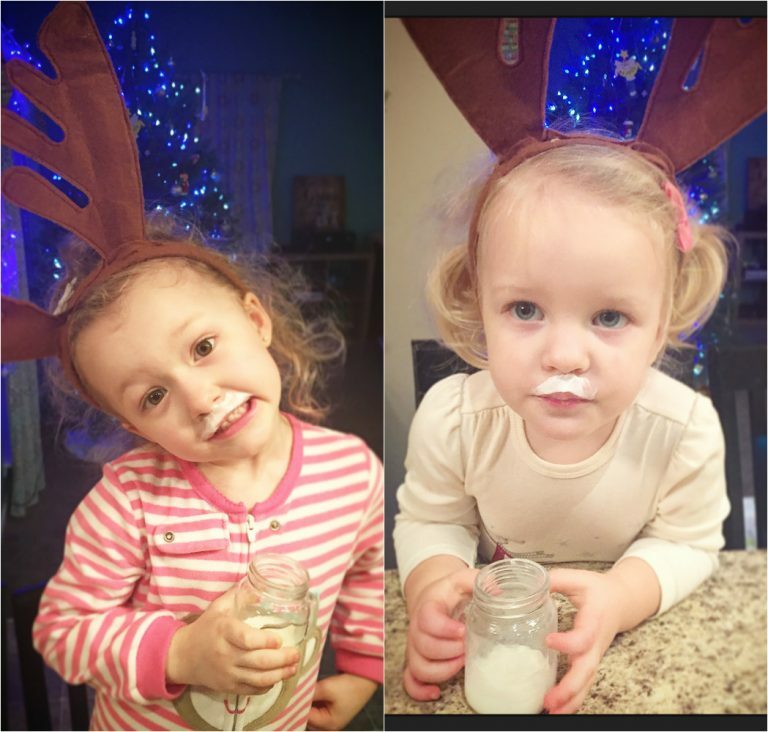 Aww – those are some adorable milk moustaches – adorable!!! Oh, these are just so fun, cheerful and festive! Love the idea of making hot chocolate in the crockpot… not that it’s a hassle to make it on the stove, but considering how crazy-busy it gets during the holidays, anything that makes my life even just the slightest bit easier or more convenient is fine by me! Anything with white chocolate and heavy cream gets my attention! And I can do this in a slow cooker? Sold! Really great recipe — thanks. This hot chocolate is just so pretty and fun! I love it! We love making slow cooker hot chocolate. It’s so easy and stress free. 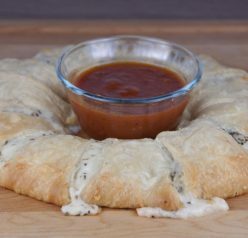 Love this recipe, and your photos. My toddler is still a milk fiend, so I love the idea of MilkLife. Thanks for sharing! And I love your hot chocolate – so pretty and festive looking! This hot chocolate looks awesome! I love that you used white chocolate because it’s my favorite! I love hot chocolate, but I don’t think I’ve ever had it made with white chocolate. I’m so trying this! Your girls are so cute!! 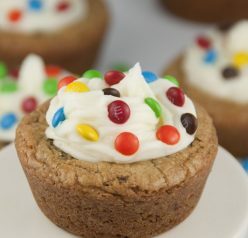 This looks scrumptious, white chocolate is for me!